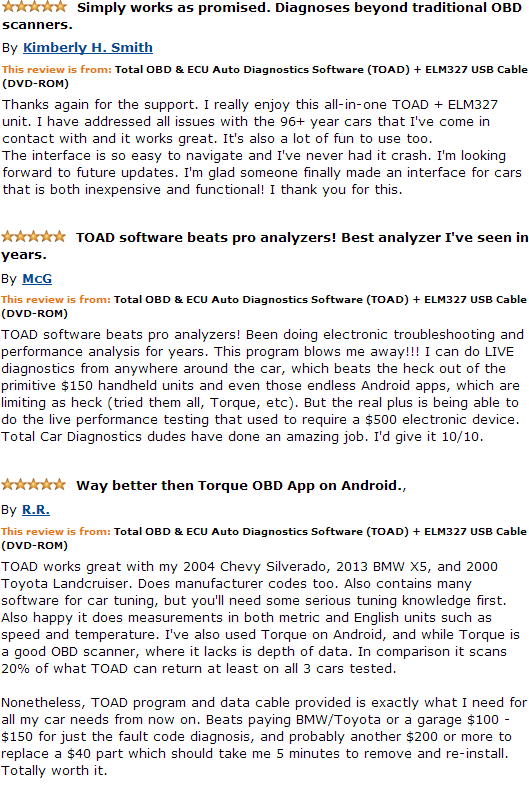 TOAD can dig deeper into car's (OBD, OBDII, OBD 2) system - than even top-end $3,000+ OBD2 scan tools. (TOTAL OBD & ECU Auto Diagnostics™)? TOAD® is a complete professional OBD2 scan tool software for ELM327 interfaces that lets you perform powerful and comprehensive health and performance checks on your car - like never before possible. It will show you in precise detail what's going on inside different systems via visual, easy-to-understand customizable graphs. It's simple as hooking up ELM327 (USB, Bluetooth, WIFI) - and loading up TOAD OBD2 Reader/Scanner Software. What's more, TOAD will instantly show you existing problems and DTC 'check engine' faults often associated with the concerning "malfunction indicator light" (MIL) on the dashboard. But our OBD diagnostic tool goes beyond traditional OBD2 scan tools or handheld OBD code readers. TOAD will tell you where the 'check engine' related fault is LOCATED - and how to fix it. This is something you'll only find possible at mechanics. Now you're totally in control! In short, this kind of thorough OBD tool capability could save your car from potential future failures — ultimately saving you thousands of lost dollars, time and frustration before the vehicle brakes down unexpectedly. Worse yet, leaving you or your customer stranded! You load up the main TOAD OBD2 software and it instantly reveals the vehicle has a malfunctioning oxygen sensor. Something you'd never know until it completely brakes down! This is a low cost repair. So you replace it in 15 effortless minutes. Without TOAD, you'd have to drive to the dealer, wait, and then get the bill that's 3x the cost of replacing it yourself. FACT : TOAD on average extracts 50-90% more DTC 'check engine' fault codes and critical operations data... than Android/iOS apps (like Torque, OBD Car Doctor, DashCommand, ScanMaster, EOBD Facile), or common hand-held OBD2 scan tools. This is because TOAD is constantly improved by finest car engineers and technicians responsible for moving auto-industry standards forward. Bottom line: This is the SAME type of software that's usually ONLY reserved for highest rated, registered and acclaimed car repair shops, manufacturers, serviceman and mechanics — which they pay upwards of $3,000 to obtain. And it's now available to you at fraction of the cost and with same capabilities as you'll see below. In addition to software's help — you'll also get comprehensive step-by-step manuals that'll save you time, money and frustration by quickly revealing the vehicles fault code error, it's meaning, where the problem is located... and how to fix it using the most cost-effective way. Is This OBD Software & Car Tuner Right For Me? TOAD® is suitable for home car owners who want to save hundreds of dollars by doing it themselves. Or for professional car mechanics/service shops that need the latest cutting-edge detection, reading and ECU car chip tuning software. What's more — we offer unlimited and lifetime personal technical support, provided by experienced car mechanics. This to ensure that you make maximum use from TOAD software for your vehicle(s). You'll be guided by expert step-by-step, simple-to-follow advice on anything that has to do with car repair, OBD diagnostics, ECU chiptuning/programming and 3rd party service recommendations. Eitherway — hopefully you'll start to notice as you keep reading below that we're authentic car experts — and the software you're about to own is absolutely world-class. Q1: Is My Car Supported? Canada: Cars made/imported AFTER 1 Jan 1998. United States: Cars made/imported AFTER 1 Jan 1996. All other countries & more info: check car compatibility here. Q2: What Systems Are Supported On My Car? You'll be able to scan vehicles Engine and Transmission systems. Two main systems that account for most faults and hazardous brake downs. 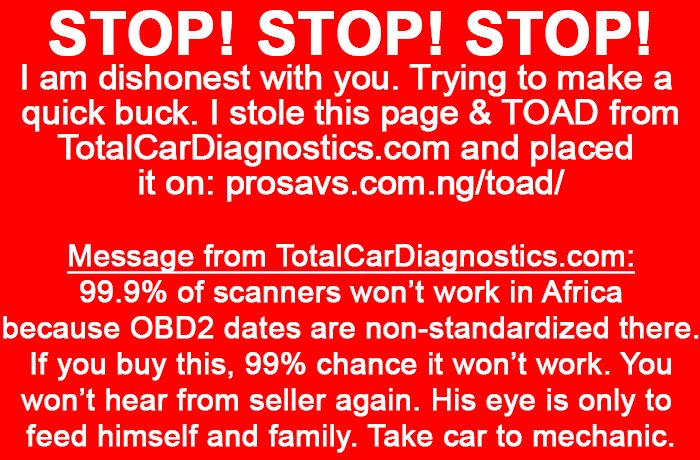 TOAD will NOT scan ABS, SRS, Brakes, Airbag. For these critical systems, safest to take vehicle to mechanic. Exception to above rule (ALL systems are SUPPORTED): Audi, Ford, Lincoln, Mazda, Mercury, Seat, Skoda, VW. More info below. If your car make is included in list below — it means TOAD will extract up to 15,000 possible data parameters related to it's Engine/Transmission — on any model. Lincoln: See Ford above. Same additional systems supported. Mazda: See Ford above. Same additional systems supported. Mercury: See Ford above. Same additional systems supported. Still not sure? Ask us. Q3: What is TOAD & What OBD2 Software is Included? 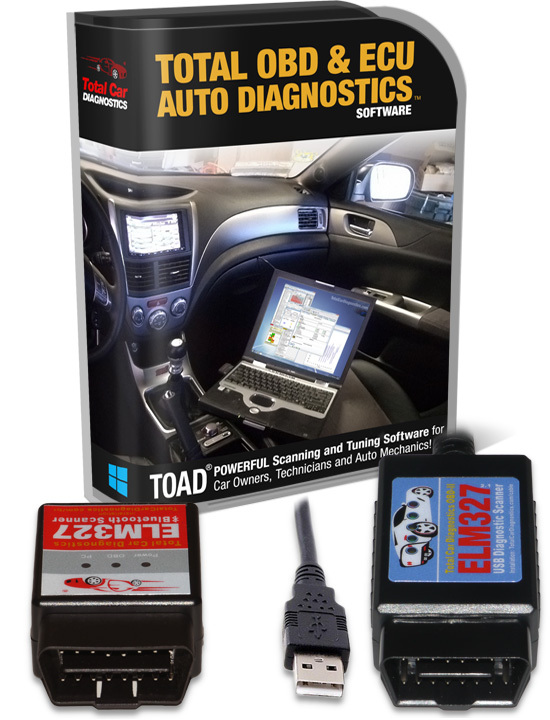 TOAD™ is collection of car diagnostics and tuning software — jam packed inside an online downloadable membership. It gives you the same functions as original dealer car diagnostic tools (that are only available at car factories or repair shops and inaccessible to the public). * Software is downloadable. But if you include ELM327 USB / Bluetooth / WIFI connector in your order — we'll ship that to your door. * Keep reading below to see what specifically it'll do for your car. All 4 categories cover absolutely every vehicle interest imaginable. Whether you're a car hobbyist — or CEO of a major car repair shop who wants to double your income. In summary: You're going to take back control of your car's performance, power, longevity and health. All from comfort of your laptop/tablet. And with less time, money and effort compared to many similar competitor scan tools on the market. Q4: What Connection Interface Should I Get? Interface is already included with your package. It'll fit in any vehicles OBD port (usually found under the steering wheel). We use our high quality genuine ELM327 USB cable, which works on all versions of Windows, including 10. If your vehicle is OBD1 — get ALDL cable. Q5: What Do I Need To Run TOAD Software? All you need is: Any Laptop or Touch Tablet (like Surface PRO) — with Windows running. All TOAD OBD software have been tested on Windows (32/64 bit) and support: XP, Vista, 7, 8, 8.1, 10. MAC Support: All TOAD software is built for Windows. So you'll need Windows on your MAC computer via either Boot Camp or Virtual machine like Parallels. Q6: I'm a Pro Mechanic. Do I Still Need TOAD? Already perform custom ECU map editing? 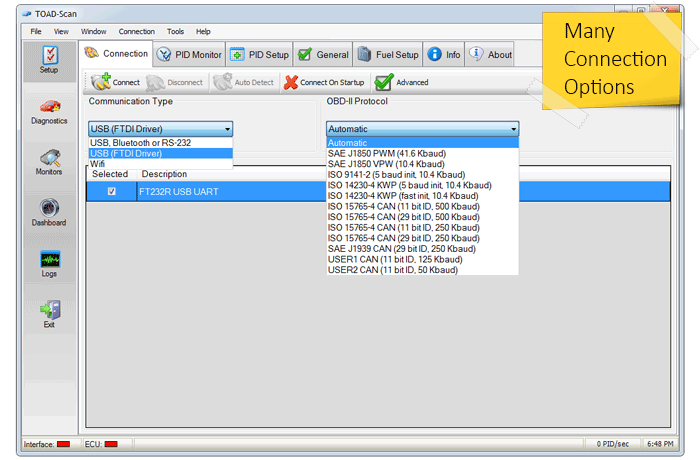 Own professional high-end diagnostic scan tools (like AutoBoss, Launch x431, SnapOn, Autel)? Consider yourself a proficient car repairer / engineer / technician? The answer is... TOAD does 99% of what high-end (in the $3,000+ range) automotive scan tools do. Because it consists of multiple applications that cover and specialize in various purposes and car systems. Including ECU map editing software. So nothing is left out. In fact TOAD is more oriented towards expert car shops then home car owners. Q7: I'm Not a Mechanic! Will I Understand TOAD? It depends on your skill set and your vehicle's problem. Whole point of our product is to help you figure out what service (if any) your vehicle requires. However only 1% of our customers ever complained about software's logistical use. And data provided by the software is easy to figure out. Just Google the fault (MIL - malfunctioning indicator light) and you'll find hundreds of open solutions from people who've already solved it. In addition, TOAD also includes this 'check engine' DTC faults database in your online membership. Either way — whether you're a skilled technician or do-it-yourself'er — TOAD offers you unparalleled access to your vehicle's OBD II systems that you can quickly examine the test results and live sensor data. Best of all... our User Guides are packed with information that will help you understand engine management and how to use our tool to diagnose the problem. If you don't have the tools or mechanical skills to perform the work, then at least you'll be armed with the knowledge of what the problem really is. Q8: Why Not Buy a Cheap Scan Tool to Clear the 'Check Engine' Light — or Just Ignore It? Because a cheap scan tool will just reset the "Check Engine/Service Engine" indicator. It won't dig deeper into the problem and tell you what's wrong and what can be done to fix it. Advanced OBD2 readers like TOAD can do this. And ignoring it until your next service is asking for trouble. Because car could be undergoing a potentially hazardous issue with unexpected brake downs. You need the peace of mind that your vehicle is in top operating condition. Even if the problem is trivial, it could affect your vehicle's performance and that's costing you money. Don't waste your time and money going to a mechanic just to find out why your check-english light in on. A mechanic will typically charge you $75 for this simple diagnostic procedure. Using our scan tool, you could do it at tome at your convenience, without the frustration of going to the mechanic only to find out your petrol/gas cap was loose. Is it time of your vehicle to get an emissions test? Most status in USA and other countries now do their testing through the OBD-II port. Our T.O.A.D scan tool package will let you to check your own vehicles emissions status before you go wait in line to pay for the test. This way you can be 100% confident it'll pass! Supports many older OBD-I and all new OBD-II cars. Can also read modern vehicles with encrypted ECU's. Full database built-in of generic fault code definitions. Increase Your Cars Break Horse Power BHP HOT! Decode Car Stereo Security Code. 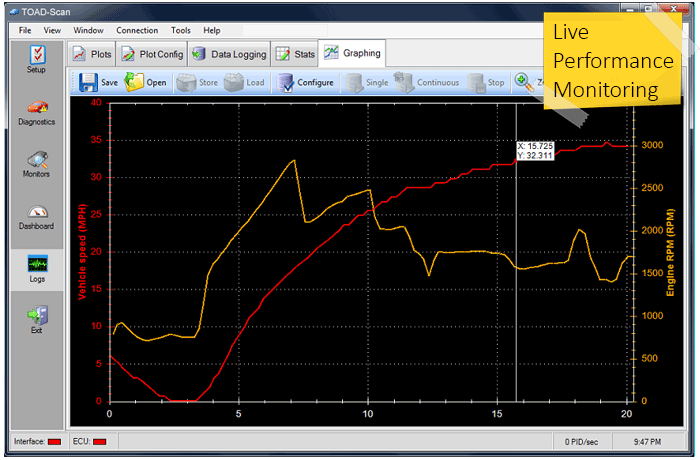 Recording and Playback of Sensor Data. You can record and playback log files in real time (1ms logging accuracy). You can save and load your log files for offline analysis. Read freeze-frame data. With Freeze Frames you will be able to retrieve a "snap-shot" of OBD2 sensor data when your ECU stores trouble codes. Don't wait until you have a problem with your vehicle. 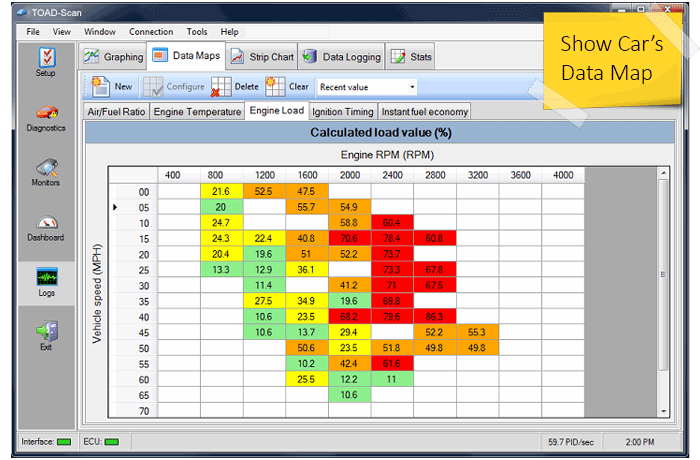 Use TOAD's Data Logger to record healthy engine parameters and use that data to help spot problems in the future. 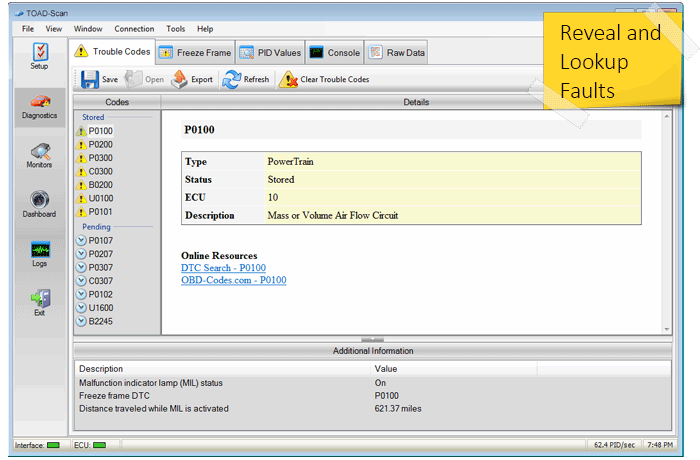 Alerts feature produces an audible warning when a parameter value (coolant temperature, RPM, etc) goes outside normal operating range. The Vehicle Manager can keep track of multiple vehicles and owners simultaneously. English and Metric (SI) unit measurement systems supported. Export with real-time stamps for easy correlation with external data logs. Read the vehicle's diagnostic trouble codes, live vehicle sensors (including wide-band O2 sensors), actuate bi-directional controls, reset adaptations, and view inspection/maintenance system test results to quickly determine what service the vehicle requires. Fast Update Refresh Rates. Older cars will do between 4 - 6Hz with generic OBD 2. Later model vehicles that use CAN will show between 6 - 16Hz with generic OBD2. Continuous real time digital/graphic display of up to 90 Pids of power train data. Software has automatic discovery of correct COM port and factory set baud rate of scan tool. Eliminating manual time-consuming configuration of software. It's install-and-ready! Read current Petrol/Gas//Diesel fuel consumption. (Liters per 100km/h, Miles per Gallon, Liter per hour, etc). Compatible with 12/24 Volt batteries. Read exact fault/condition of DPF (Diesel Particulate Filter) & EGR (Exhaust Gas Recirculation) — so you know what and how to fix it. DPF and EGR regeneration. Regenerate, remove or disable DPF and/or EGR condition. This is crucial for all Diesel vehicles. Actuator Function: Let's you activate various vehicle components into test mode to verify they're actually working properly on physical level (not just what sensor picks up). How Is TOAD Different to Other Similar Car Diagnostic Packages On the Market? While TOAD stands as the king of "manufacturer-approved" professional all-in-one scan tools for both DIY car owners and mechanics — it's not the only package of it's kind. TOTAL OBD & ECU Auto Diagnostics® (TOAD) is a 2-in-1 package. 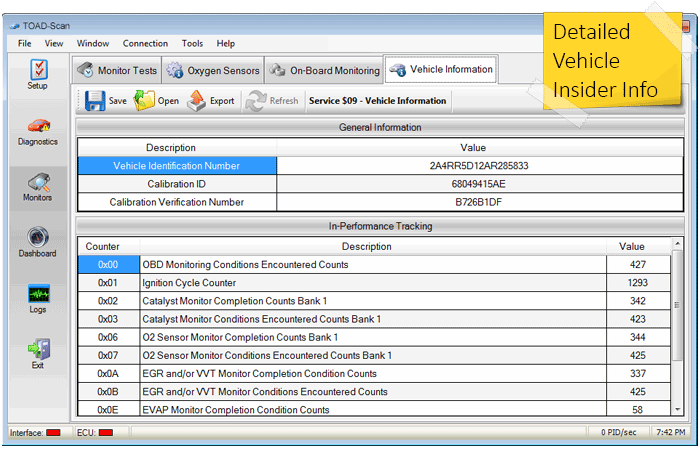 OBD software: Performs car diagnostics, scanning, reading, fault analysis, etc. Most competitors will only provide software that deals with generic universal OBD codes/parameters (applicable to all cars). Meaning most of car-brand-specific factors won’t be read. Usually limiting the software at 50% of it’s capabilities. TOAD includes generic and car-brand-specific codes/parameters. Meaning you’ll have equal control of the car’s OBD/ECU as the original manufacturer does. The Manuals are all layed out in a step-by-step, structured order and easy to understand, even for an average home person. However it does have comprehensive sections for advanced mechanics/service repair shops. For example, each chapter shows trouble codes, their probable causes, their locations, and their solutions. In addition, it also lists all the car models throughout the world to whom those codes, faults and solutions apply. So it doesn’t matter what car you own or dealing with, because it’s included with sections of dedicated material on it. Meaning, you’ll save time and frustration by quickly pin-pointing the problem and how to fix it using the most cost-effective way. Okay, So What's the Cost For this Incredible Package? Last time I checked, buying a professional OBD scanner, car diagnostic tool or OBD code reader... that's constantly UPDATED and improved to have maximum compatibility with the latest OBD2 car standards — would set you back at least $3,000. Now imagine buying software for both reading car data PLUS car tuning / reprogramming car chip data. You're looking at least over $25,000. And there's no guarantee competitor software will 100% because you're dependent on ONE software only to do the job. With TOAD, you'll have multiple software applications as form of backup. Each has it's own set of strengths. This exponentially increases your chances of successfully connecting to cars OBD2 diagnostics system and performing tuning. Without TOAD — you can always take your car to a mechanic who is going to charge you at least $250+- p/h for a single typical job that TOAD can perform from comfort of your laptop. And what happens when you stack multiple jobs throughout the years of owning your car(s), for various issues it may encounter? We're talking about spending an average $20,000 with car mechanics, just to keep your car running! With TOAD, you'll significantly cut this cost down by up to 50-80%. Because you'll be always armed with knowing what's really wrong. Hence no dealer can over-charge you for a broken part. This also puts you in power for negotiation to get the best possible price! With TOTAL OBD & ECU Auto Diagnostics®, you win. Because I'm not going to charge you anywhere near the thousands of dollars that you'll ultimate save when you get a hold of this package. Especially when you account all the lost time and frustration you would've otherwise likely experienced without these powerful tools at your disposal. 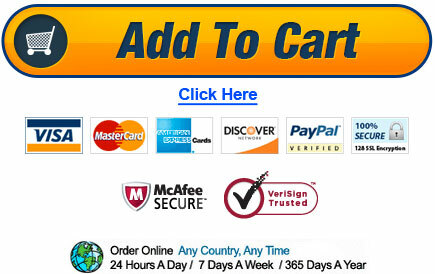 I've decided to make this all-in-one software package available to you for only $899 $499 $397. Simply because we'd like to make this available to as many folks who are in need of cutting down on costs and saving time and overall headaches. Your investment is still minuscule to the costs you'll save as I've mentioned above. Plus this is a one-time investment for lifetime support. The world's most powerful, complete and comprehensive OBD/ECU diagnosis and remapping software package can be yours in the next 5 minutes by placing your order . Look, we've been in this car diagnostics industry for 15+ years. We're not here to play around. Nor waste anyone's time and money. 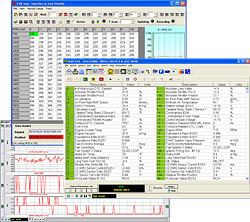 We personally used almost every OBD2 software/scanner for thousands of different vehicles throughout our career. For that reason I can separate the good from the bad. The powerful, accurate, genuinely-useful, compatible and reliable — from the generic, featureless and incompatible. And what we've done is combined all the best OBD2 scanning technologies from every known OBD2 software on the market (including Android OBD apps), and loaded it into our TOAD OBD2 Windows laptop software. On top of that, you have our lifetime support. Simply can't go wrong. Which is why I'm so confident that you too will find our OBD software extremely profitable, helpful and reliable throughout your use. For this reason, you have 1 full year from today to try and play with the software. And if for whatever reason TOAD OBD2 laptop software doesn't save you tons of time, effort, money and remove frustration in regards to car servicing, repair and tuning — then simply email us and we'll issue 100% refund on the spot. (All licenses will be remotely disabled and membership restricted on refund). Factory applications for SPECIFIC car models. All generic scan tools can only access the powertrain/transmission and engine. With our car-model-specific applications — you can access additional crucial engine components that generic or Android apps and scan tools can’t see, and are still years behind TOAD. Lifetime software updates for free. You’re our customer for life. You can submit unlimited support tickets/emails with any questions in regards to fixing, diagnosing or reprogramming your car. So this certainly isn’t a one-off transaction. We’re in it to build a lifetime relationship with you. You have 1 full year to try and test out the software. If it works, great! If it doesn’t, we’ll apologize for wasting your time and refund your order. Meaning you simply can’t lose by choosing to place your order TODAY! Thousands of helpful pages (especially for mechanics) on trouble codes, their probable causes, their locations, and their solutions — for dozens of car models. We’re not “another” quicky seller of car diagnostic tools – only to disappear overnight… as we’ve watched dozens of quick-buck car websites, go down since 2011. Therefore you’re getting getting involved with experienced car mechanics and long time solidly established technicians who deal with fixing, engineering and tuning cars for a living. So you’re in SAFE and RELIABLE hands of experienced life long customer support. Yes! I understand when I place my order now — I'll get INSTANT download access to TOAD software in my private online membership. I'll also have ELM327 USB Interface shipped straight to my door - and this is all I need to get started ASAP! Advanced, cutting-edge OBD software that only the highest rated and acclaimed car repair shops, manufacturers, serviceman and mechanics use. Software is easy and straightforward for any inexperienced home user. Software also contains help files on how to use and operate. Manuals that cover car models and their fault codes. Including their probable causes, their locations, and their solutions. Your software is registered with a unique License Code for support purposes and registration of software. I urge you to take action right now and grab this package before we raise the price back to $397.00. It's discounted for a limited time because we're currently doing a marketing test at $97 vs. $397. Trust me, you won't want to miss out on this one. Former Lead ECU Software Programmer at Toyota Motor Europe in Brussels, Belgium. BMW Series-3 Car Engineer at Headquarters at Munich, Germany. P.S. Is your vehicle supported? Click here to find out. P.P.S. Software updates are free for life. Meaning you'll always be up to date with new car releases. And never be stuck because you can always rely on our unlimited lifetime support. P.P.P.S. Remember, I'm putting all the bets and risk entirely on me. Because I'm gladly covering you with a unconditional, fair and honest 1 year money back guarantee. Meaning if TOAD doesn't help you or you're not satisfied with it for whatever reason —simply contact us and we'll help you out. Page content Protected by Copyscape.